A very common problem occurs when one of your keys breaks. The key may break outside of the lock or while in the lock. If it breaks outside of the lock, you need to take the broken pieces to a professional locksmith and have a new key originated. If the key is extremely worn, the locksmith must come to where the lock or vehicle is to ensure correct origination of a new key. Saturn vehicles along with older G.M. 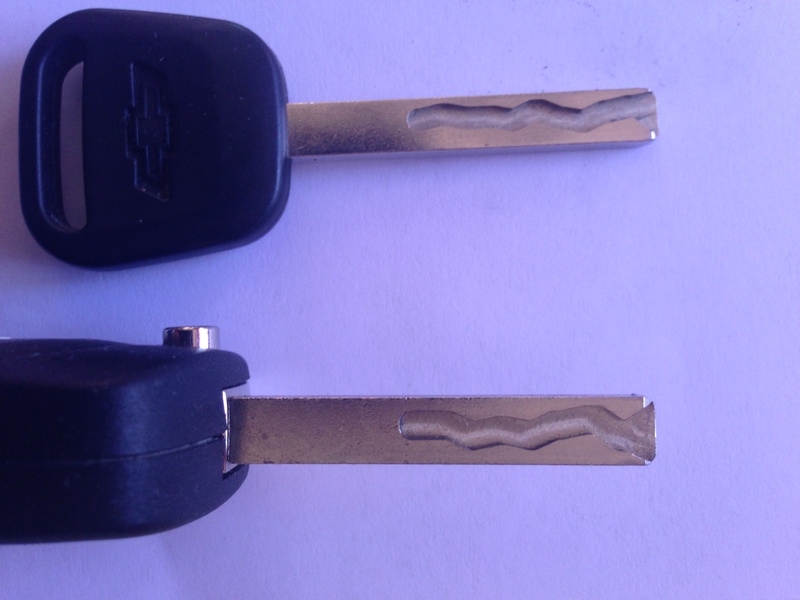 vehicles with single sided keys are notorious for worn keys that are not easy to decode. If the key has broken off in the lock, do yourself a favor and call a Professional Locksmith to extract the broken piece from the lock. Locks contain many small springs and parts that can easily be damaged from someone not skilled at lock service, attempting to remove a broken key. Weekly, we see the results of someone attempting to remove a key and inadvertently destroying the lock or making the key extraction even more difficult. Replacing the lock will definitely cost far more than having the key extracted by a professional. To avoid the problem of a broken key, replace any keys that have small fractures or crack in them as well as worn keys. Also, have a professional look at the lock and key when they become hard to operate. Most often, a lock that does not operate easily may be the result of a worn key. I have seen numerous vehicle locks replaced by mechanics when only the key was worn, costing the motorists far more than would have been necessary to replace the key. In the old days a key breaking was strictly a mechanical failure of the metal key, but todays vehicle keys also include electronic components to remotely operate locks as well as an anti-theft device known as a transponder. Outside of Nissan and Chrysler vehicles, the transponders rarely fail, but the plastic cases on all of the remote head keys seem to break quite easily. When the metal part of the key breaks, it just requires obtaining a new key cut to match the broken one unless electronic components are involved. Dr Auto Lock stocks many common shells for keys containing electronic components when just the shell or metal part of the key breaks. It is far less costly to just replace the key shell than to replace the electronic components as well. This is also true of keys that only contain a transponder chip. 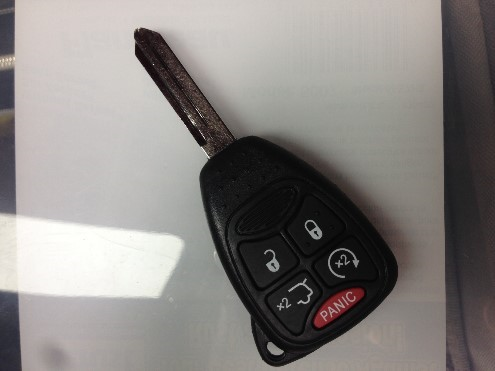 At Dr Auto Lock, we can usually replace the shell and reuse the transponder chip from the broken key. Reusing the electronic components usually does not require the reprogramming of the electronic components, making the repair less costly. Always purchase your replacement shell from a local locksmith, as most locksmiths are not willing to cut keys of unknown materials. Many cheap keys sold online are made of cheap materials that may damage expensive key cutting equipment. We have also found that many of these shells will not properly allow the electronics to fit into them. Once the cheap shell is cut, the scam artist who sold them to you will not refund your money, and usually they refuse to give you a refund even if you did not have the key cut. The most common vehicles that experience remote head shell breakage are Lexus and Chrysler vehicles. The plastic breaks quite easily on these vehicles and we replace quite few of them. Almost all other vehicles are susceptible to having the metal key blade break after the key has been bent. Flip blade keys used on German vehicles and domestic vehicles tend to break where the key blade is pinned to the remote. These failures require a new remote with electronics and programming. The G.M. remotes are the least costly to replace while the German ones cost the most. The most important thing to do is to visually inspect your keys weekly. If you see a small crack or fracture starting or if the key is bent, get it replaced immediately. It will cost even more if the key breaks off in the ignition lock. If the key does break off in your ignition, do yourself a favor and call a professional automotive locksmith to extract it. I have replaced hundreds of locks after the vehicle owner or some know it all friend attempted to remove the key, ruining the lock in the process. And finally do not ever try to use super glue to remove the key, it will ruin your lock. The upper key is a transponder key w/o remote while the lower key is a remote flip key. There is nothing worse than realizing that you have just lost your car keys. Your mind goes blank, trying to remember where you last placed them or saw them. Who do you call? Due to advanced electronic theft deterrent systems in most all modern vehicle keys, you have fewer choices. A spare key at home is the best solution, but that is not always available. You must now find a professional automotive locksmith who can service your car or have it towed to the new car dealer. The dealer may have to order a key from the factory and schedule your car in for service, meaning that you will be without your vehicle for days or weeks. Your car may also be damaged by the process of towing it. Many vehicles over 10 years old can not be serviced by the dealer as codes are no longer available as well as the programming tool being obsolete. A professional automotive locksmith such as Dr Auto Lock can go to your car and originate a new key as well as programming the key to the car. If you have a German vehicle, you are stuck going to the dealer and ordering a key from the factory. The Germans are still fighting the war, refusing to realize that they lost. We can service some early VW and Audi cars up to 2005. Some recent model cars may also require dealer service as the programming software for our tools has not yet been released. Beware of very low production vehicles like Jaguar and others. These vehicles are so rare that most locksmiths cannot justify the cost of equipment to service these vehicles. All GM, Ford, Chrysler and almost all Asian makes can easily be serviced. Hyundai and Kia have been changing the type of keys they use so often that they have created a nightmare for the owners of these vehicles. 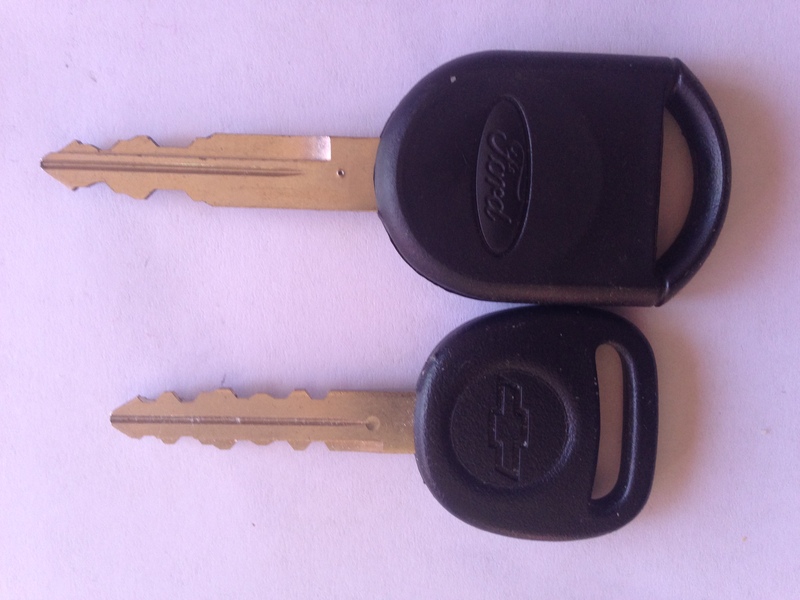 Ford and Chrysler have both used the same key design for quite some time ensuring easy serviceability. GM has made their key systems very serviceable as well. Calling a locksmith at night, on a weekend or holiday is going to be more expensive than during a weekday. Just because someone offers 24 hour emergency service does not mean that you will not pay a premium for that service. When you are in a rural or sparsely populated area, you may have to contact a locksmith from a distant city. The equipment to service modern vehicles is extremely expensive and cannot be justified by small town locksmiths. The best policy is to demand two or more sets of keys when you buy your car. Also demand that the new car dealer supply you the key code and pin code for your vehicle and keep these codes in a safe but accessible location. Just think of being on vacation, 800 miles away from home, and you lose the keys to a Mercedes or BMW. You are SOL and will be with out your car for quite some time. It will be the vacation from Hell. You may have noticed that keys to newer vehicles can no longer be made at hardware stores and some cannot even be made at the new car dealer level. The newer keys are milled with an end mill instead of being cut with a traditional cutting wheel machine. Manual duplicators do exist, but they do not produce the same quality key as the computerized machines. At Dr Auto Lock, we cut these keys for most of the new car dealers. They do not want to invest in an extremely expensive machine with good reason. 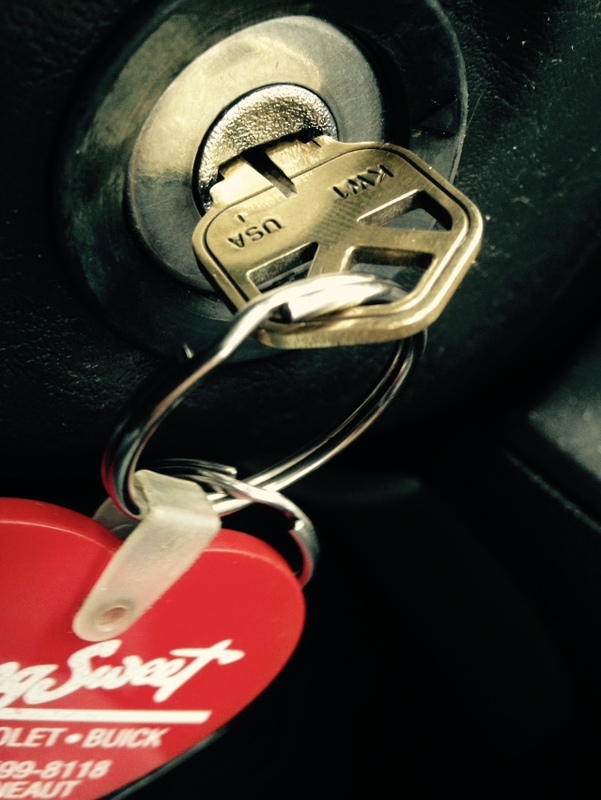 Did you notice that this picture shows a house key stuck into a Ford ignition lock? When this happens never try to pull on the key with any level of force. It will break off creating a worse situation and possibly damage the lock, necessitating replacement. Puting the wrong key into a lock happens quite frequently. If you call a professional locksmith immediately the key may be extracted without damage. If the wrong key was forced into the lock with extreme force, the lock may have to be replaced. The lock in the picture had the key extracted by a professional and the lock was not damaged. Many times the correct key is broken off in the lock. If the key is sticking out of the lock, you may use pliers or forceps to pull it out. Never push the key in further. If the broken piece is not sticking out of the lock, do yourself a favor and call a professional locksmith to extract it. Sticking tools into a lock can cause damage and in most cases where someone who did not know what they were doing tried to extract the key, the lock was damaged and needed repair. Never and I repeat never use superglue or some other adhesive to try to remove the key. I am amazed by the amount of people who try this. It always destroys the lock. Key extraction requires special tools and a very good knowledge of lock design.